Vermont has little discrepancy between state-reported student proficiency rates and those found by the National Assessment of Educational Progress (NAEP), according to a newly released follow-up analysis by Achieve, an independent education advocacy organization. 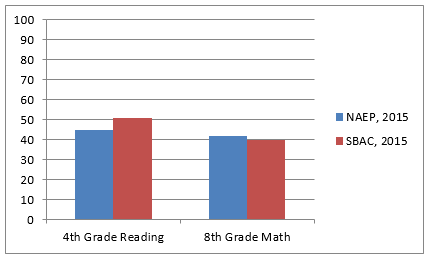 Through the implementation of Smarter Balanced assessments, Vermont had discrepancies between state-reported and NAEP proficiency rates of six percentage points in fourth-grade reading. In eighth-grade math Vermont also reported proficiency rates two percentage points more rigorous than NAEP. Vermont is also recognized as a Top Truth Teller in 2015 for having a proficiency score within five percentage points of NAEP in eighth-grade math. Vermont was not included in the 2013-14 comparisons because it piloted the Smarter Balanced assessment and did not report state-level proficiency scores that year.